VietNamNet Bridge - The northern province has favorable natural conditions to develop the use of artificial sand as natural sand resources in the locality are becoming limited. There are only five areas where sand exploitation is allowed. These include three licenses for exploiting sand and gravel for normal construction and two licenses for exploiting sea sand to use as materials for leveling the ground, with total licensed area of 65.6 hectares and designed exploitation capacity of 210,000 cubic meters per annum. Of 14 licensed waterways dredging projects, only two of them have been operational with the total volume of 130,000 cubic meters of sand and gravel collected so far. Meanwhile, the demand for sand in the province, under the building material development strategy by 2020 approved by the provincial authorities in 2015, is high. The demand for construction sand in 2015 was 2.1-2.15 million cubic meters, while the figure is expected to rise to 2.6 million by 2020. The demand for materials for leveling the ground was 2.51 million cubic meters in 2015 and the figure will be 67.51 million a year by 2020. In such conditions, the Quang Ninh Construction Department has planned solutions to ensure the sand supply for urban development, transport and technical infrastructure projects. In 2016-2020, in addition to the maintainence of the sand exploitation at licensed projects (with the total capacity of 450,000 cubic meters per annum) and two new exploitation sites in Hai Ha and Ba Che (100,000 cubic meters per annum in total), Quang Ninh will set up sand grinding units in Dong Trieu, Uong Bi, Hoanh Bo and Cam Pha with total capacity of 750,000 cubic meters per annum. It will also consider using saline sand in the eastern part of the province to make construction materials, taking advantage of available saline sand in the area to ease the shortage. To implement the strategy on developing building materials, Thien Nam JSC has got the nod from the provincial authorities to start a project on collecting and processing sandstone at the waste area, put under the control of Than Coc Sau coal mining company. The project uses modern technology to make building materials from sandstone, which is waste in coal mines. The building material products have been examined by the Building Material Institute. 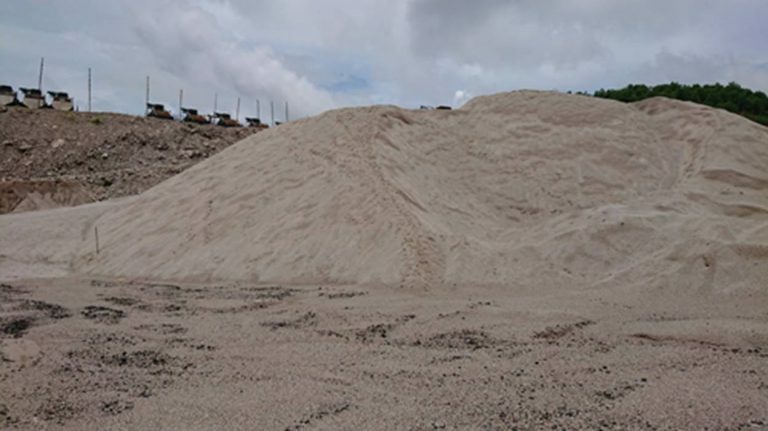 The ministry on July 14 said that encouraging enterprises to develop the production of grit sand instead of natural sand is in line with the government’s resolution.